Learning DIY techniques is an essential life skill that everyone should know. There will come a point in your life where you’ll need to fix something or do some kind of DIY. By learning the basics now, it’ll set you in good stead for the future. There should be something on this list that you either can do already or will have no trouble learning to do. A great DIY skill for you to learn is how to change a fuse. And I don’t mean flipping a switch back on the fuse box. I’m talking about replacing plug fuses. The small metal cylinders that power all plugs. Often when an appliance stops working it’s got little to do with the appliance itself. More often than not it’s because the fuse has gone. What you need to do is remove the old fuse and replace it with a new one. Some fuses are simple to get at; others will need a little more effort. When it comes to changing the fuse, make sure you use the same type of fuse. They have different voltage, be sure you get the right one. You also need to know about more practical DIY skills. And one of the big ones is tree-felling. Now, you’ll almost certainly have a tree in your backyard that needs to come down. Or, more annoyingly, it could be in your neighbour’s yard, but overhanging into yours. Don’t worry, just make sure you cut it back. To make your life easier you’re going to want to dig out your chainsaw and use that. It might be a long while since you’ve used it, and it might need oiling up before it works right. Don’t worry, just visit a UK chainsaw oil supplier, pick what you need, and give your chainsaw a little TLC. Then you’ll be good to go, and you can get rid of that tree forever. One of the more basic things that you can do around the house is to put up shelves. This is a basic but useful skill to have. Shelves come in handy all the time, and you might want to think about putting some up in your room. You can put up loads of different types and designs of shelf depending upon what you need them for. This is a job that you shouldn’t find too difficult to do on your own. Just pop to the local hardware store and pick up some wood that you can cut down to size. 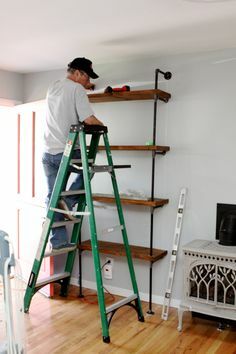 You could even pick up ready-made shelving units and just focus on putting them up. At a more basic level painting is perhaps the simplest form of DIY. This is the one thing that almost anyone should be able to do. You won’t need to pore over manuals or follow instructions to do this. As long as you get the stroke pattern right you should find painting a relative breeze by DIY standards. Just decide what kind of colour scheme you’re after and go nuts. It’s amazing the sort of difference a fresh lick of paint can make to any room.